MEPT-JT started life in 2008 as a suggestion by Murray ZL1BPU (known for off-the-wall digital mode designs and - relevant to this new design - development of drift-proof IFK+ modulation). Joe K1JT took up the challenge, designed the software, and added many improvements. The proposal was to develop a tool for ionospheric propagation measurement (sounding), using a technique that would provide the highest possible sensitivity, along with very narrow bandwidth, thus allowing measurements to be made with very low power (typically 100mW) and minimal footprint on our valuable band-space. The sensitivity would be so high that - even with low power transmissions - there would be sufficient margin to allow detection of the weakest openings. The intention was that participating stations could either transmit sounding signals, or receive those from other stations (or both), and thus since by agreement all stations would operate within a fixed small window on each band, all stations would be able to build a log of callsigns, locations and (knowing both the transmitter power and the received signal to noise ratio) even the path fade margin for each 'spot'. With these spots posted to an internet database, anyone (even non-Amateurs) could analyse the database and study propagation in any way they wished. Conventional sounding techniques (pulsed and chirped ionosondes, and PN sequence sounders) require high power or wide bandwidth, or both. The IARU/NCDXF beacons which operate on 20/15/10m cannot provide automated logging to a database, and also are limited in sensitivity, require high power, and only exist in a few locations and bands. We were designing a narrow-band low power automated system suitable for all locations (hundreds of stations) and all bands. While the proposal was initially for HF operation, MEPT-JT has since found wider use as an ideal tool for LF and VHF, especially 6m, where openings can be detected almost before they happen. With the addition of the internet spot database, agreed operating frequencies on all bands, and plenty of participating stations, we now have an excellent real-time, world-wide, all-band propagation tool! Hint: Visit the WSPR Spot Database (Click on 'Specify query parameters') to see how it all works. Set up your own custom search - you don't need to transmit or receive, to be a member or to log in to use the database. You can also download the whole database and analyse it locally with a spreadsheet program. Essentially, the idea was to take a very small message (callsign, locator and TX power), code them as tightly as possible, add forward error correction, and then combine this with a known pseudo-random sequence, to generate a two minute long message to be sent using 4-FSK modulation and a very slow baud rate. Joe estimated that the theoretical sensitivity of the system would be -30dB S/N! ZL1BPU's contribution of drift-proof IFK was an essential feature of the proposal, since it is impossible to handle very narrow frequency shift signals without extraordinary transmitter and receiver frequency stability, and even then the Doppler effects of the ionosphere would make life difficult. A slightly different approach was taken for MEPT-JT. IFK (Incremental Frequency Shift Keying) uses differential frequency keying, so drift is cancelled since the data carrier by each tone (symbol) is determined by a differential frequency measurement from the previous tone. ZL1BPU and Con ZL2AFP developed a high resolution FFT technique able to make these differential measurements, subtract out the data and cancel drift and Doppler. MEPT-JT has a fixed message length, and so a post-processed variation of this idea could be used, using the high resolution FFT technique to measure and cancel the drift in the received signal after reception, but before detection, without requiring IFK coding as such. K1JT had considerable experience with the development of weak-signal modes for VHF EME and Meteor Scatter, and contributed the PN sequence technique used to exactly synchronize the received message (making computer timing less critical), the idea of randomized transmit and receive cycles (so all stations could both receive and transmit), the ability to handle widely drifting signals by post-processing, and the ability to decode multiple signals in each receive cycle. Once the idea took off, other people contributed further good ideas, such as QSO mode, what to store in the receiver log, the web database with automatic update of 'spots', and a world propagation 'spot map'. The web spot map showing EU spots over a 24 hour period on the 10m band! FSQ is another MFSK mode with IFK, intended for easy chat-type communication on the MF and low HF bands. While it is primarily intended for message passing at 40 WPM, it also has 'sounding' capability which can be put to good use in understanding propagation between two or more stations. More about that later! Each transmission takes nearly two minutes, and always starts on an the UTC even minute (hh:00:00, hh:02:00, hh:04:00 min:sec etc). The transmission contains 162 tone symbols using the four tones 1497.80, 1499.27, 1500.73 and 1502.20Hz (which are translated to RF frequency by the SSB transceiver). Transition between tones is phase continuous. Thus the transmission is 4-FSK (two bits per symbol). The symbol rate is the same as the tone spacing, 1.466 baud, and the tone duration is 1/1.466Hz = 0.682s. So the transmission takes 162 x 0.682 = 110.50 seconds (1min 50.5s). The remaining few seconds before the next two-minute time slot is used by the receiver to post-process and decode the signals. The transmitted message is pre-coded, and since the message is fixed, this only has to be done once. The message consists of callsign, grid square (Maidenhead Locator) and transmitter power in dBm. The message is compressed to a minimum number of bits (28 + 15 + 7 bits respectively), making a total of 50 message bits. A binary convolution FEC code is used (K=32, R=1/2), and the number of channel bits ( (message bits + K-1) / R) is therefore 2 x (50 +32-1) = 162. A 162 bit PN sequence is transmitted at the same time, meaning that each symbol carries one channel bit and one PN bit. 4-FSK allows two data bits per symbol, so the total transmission duration is 162 symbols or 1 min 50.5s as explained above. The name 'MEPT-JT' derived from 'MEPT' (Manned Experimental Propagation Transmission), a generic name for range of different low powered techniques, and 'JT' being Joe Taylor's initials. It is one of a general family of D-MEPT (digital MEPT) modes, as opposed to the historically more popular V-MEPT (visually detected ) techniques such as QRSS Morse and S/MT-Hell. The MEPT-JT transmitted bandwidth is about 6Hz, and the ITU 'Emission Designation' for this mode is 6H00F1D. Because the tone spacing and baud rate match, the receiver detector filters (consisting of overlapping Discrete Fourier Transforms operated at an exact multiple of the baud rate) are able to independently decode each tone without energy from one tone appearing in the detector intended for the next tone (a property called orthogonality). The narrowest spacing at which this independence can occur is when the symbol period and tone spacing are reciprocal. This behaviour happens because at the filter frequency the adjacent tones have an uneven number of tone half-cycles in the detection period, so the filter output phase changes continually during the tone integration period, and the adjacent tone energy sums to zero at the exact duration of the tone. The correct tone, however, has an even number of half-cycles, no change of phase, and the energy accumulates to a maximum over the tone detector duration (the detector uses a technique called 'integrate and dump', and operates synchronously with the received symbols, using sync recovered from the PN sequence). While WSPR (the software which operates MEPT-JT) does not use IFK coding (direct FSK coding is much more efficient when the number of tones is small), it achieves an equivalent result at the receiver by identifying the mean frequency and frequency slope of the transmission, and using this information to recalculate the actual transmitted tone frequencies. This is possible because the transmissions are of a fixed duration and there is plenty of time between transmissions for post-processing. The addition of the PN sequence spreads the signal and (since a cross-correlator is used) adds coding gain when it is subsequently de-spread, and this also assists in reducing the effect of carrier interference. The PN sequence also exactly identifies the start of the transmission and the location of each symbol, so there is minimum energy loss as each tone is synchronously detected. Because a very low symbol rate is used (1.466 baud) even the longest multi-path variations cause very little inter-symbol interference. The current software will reliably and routinely detect and identify signals as low as -27dB S/N in 2.4kHz bandwidth, only 3dB short of the theoretical limit. The above screen-shot illustrates that ground wave propagation on 474 kHz (630m band) is viable throughout the day - even with transmitter power as low as 5W (EIRP 50 mW). At night the E layer allows stronger reception, although with fading, as the E later and ground wave interact. While not as sensitive as WSPR, and (at the moment) lacking an internet database, FSQ operates much faster than WSPR, and operates in real time. The software is called FSQCall, as it supports selective calling, link establishment, management and messaging. It also logs transmissions from other stations, which can either be studied from a local log, or be plotted graphically on the computer. The plotting software is called FSQPlot, and runs real-time by scanning the FSQCall Heard Log. Participating stations need to be on the calling frequency, and set their Sounding option to on. FSQCall and FSQPlot log and plot traffic as well as soundings. Unlike MEPT-JT/WSPR, FSQCall is completely asynchronous. You don't need to mess about with accurate computer time bases or precise two-minute transmissions. The FSQ soundings are only a few seconds long. Plotting can be automatic, and always up-to-date. The FSQPlot graph portrays SNR (Signal to Noise Ratio) vertically against time of day (horizontally). You can continue the plot for days or weeks, and the spots will overlap at the correct time as one day turns into another. The software looks not unlike the WSPRplot software mentioned above. In the above example, separate stations were transmitting from the same site, on 3.5 MHz (red) and 3.9 MHz (green), and received at a range of 350 km. The time scale is local time. Notice that there is a strong dip in the signals during the middle of the day, caused by D-layer absorbtion. Since, however, the soundings were correctly received even then, the study proves that the paths were viable all day. This experiment was run over 24 hours to determine whether propagation during the day favoured the upper end of the band. You can see that it does, but only slightly. FSQPlot can display soundings from up to six specified stations at once. In this study two receivers were operating on different frequencies, both contributing audio to FSQCall. You can also plot FSQ soundings and traffic data after the fact, even weeks later, as FSQPlot operates from any stored log file. 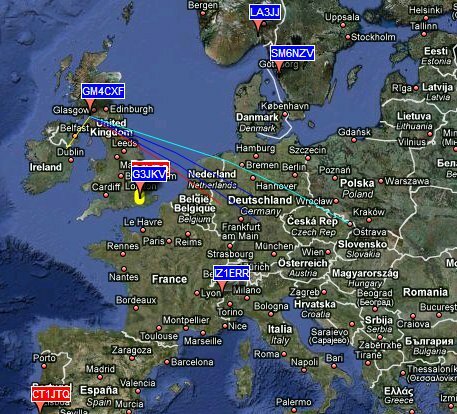 The WSPR software and operating hints are available from the K1JT website. The spot database, spot map, activity list and forum are on the WSPRnet site. 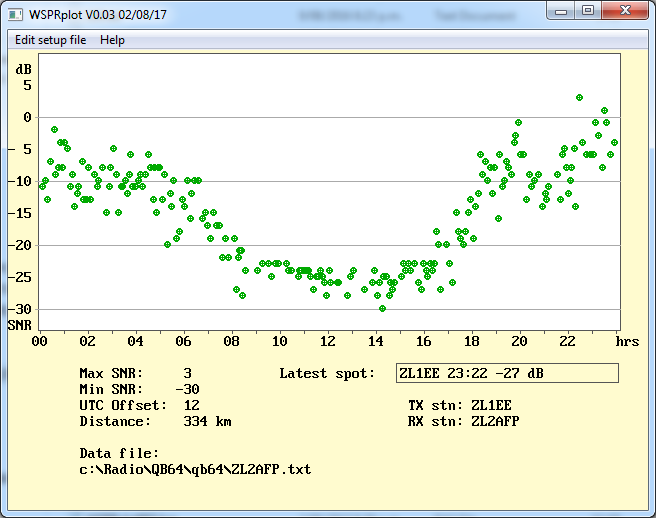 The FSQCall and FSQPlot software are available from the ZL1BPU website. Both are well documented.